Apple needs a social network like it needs a hole in its head. There are plenty of places to share pictures of your food and your plans for the weekend and the biggest tech company in the world doesn’t need to be one of those. But wait, you might say, what about Ping? Apple launched a product that has an online profile and the ability to share music and comments, isn’t that a social network? Sort of. Apple’s Steve Jobs described it as ‘Twitter or Facebook for music’ when it was announced back in 2010, and it certainly has elements of those services. You can follow people or musicians, see what kinds of music they like and post thoughts on songs or albums. It was also unquestionably introduced to help users discover new music, surfacing millions of back catalog songs through sharing. The core of the Ping product is the ability to share links to songs on other networks and with your friends. This is why it exists: to sell more songs from iTunes. Apple is a company that makes money selling things. Whether those are digital items like songs or physical products like the iPhone and iPad. Nearly every move the company makes is in the service of doing that better and making the experience of doing that better for the customer. While its moves may sometimes feel counter-intuitive to common business sense, its overall success speaks to this having worked very well over the last few years. This is why Apple should use its acquisition of app discovery, search and sharing company Chomp to make the App Store into a community. Not a social network, but a place where app lovers and users of Apple products can congregate and share, creating that frisson of discovery, sure, but also to engage in a conversation. Apple could use its considerable resources to build its own but it doesn’t. It makes small, smart acquisitions like Siri to shortcut the process. I know some people who have used Chomp are concerned about its value to the App Store, but Apple makes so few of these acquisitions, and has so much onboard talent, you can bet that these kinds of pickups are audited heavily. It usually goes after small companies because they are more likely to be able to adopt the Apple way. A community based around the sharing and discovery of apps would directly drive sales and it would transform the current store from a front page of top tens to a deeper archive that could be churned and tilled with better internal metrics like number of shares with a friend, one-touch Twitter sharing based on the new iOS and OS X Mountain Lion integration and perhaps even Facebook sharing options. If you were friends with someone on the App Store, you could recommend an app and have that recommendation delivered right to your friend’s phone in the form of a notification. A tap and they could see a preview and purchase the app right there. But even more importantly, an app community would create a two-way platform for discourse between users and developers. Apple’s current App Store is a one-way conversation, with a customer of an app making one concise statement, at times misleading or misinformed, but nevertheless practically unaddressable. What’s needed is a deeper system for commenting on apps, replying to comments, within reason, and most importantly, rater accountability. The system that personal cab service Uber has in place is an interesting one, because it allows the driver to rate the passenger as well as the other way around. This means that you can actually be held accountable for being a jerk. Having dedicated profiles on the network would discourage snap judgement reviews because the ‘this is helpful’ buttons would be linked to your account. The more helpful your review is, the better your reputation for ratings and the higher it would appear in the comments section for an app. This is the way that Amazon does it and it’s obviously the way that the App Store is supposed to work, but it doesn’t because there is a lack of accountability. 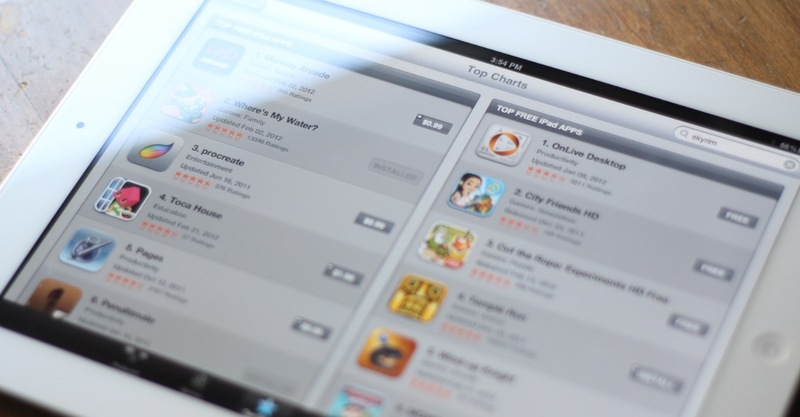 A large portion of what Chomp does is dedicated to searching the app store in a more powerful way, making better suggestions based on your preferences and surfacing apps that may be outside of the ‘top 100’. But out beyond that, building a community on the App Store would help to address issues like the recent spate of app clones. It would make any gaming of app ratings more evident and it would allow for the mitigation of the dreaded ‘one star because I didn’t get it’ reviews. Apple doesn’t need a social network. Not only are there options out there that already account for large chunks of valuable user attention and time, but it provides private tools like iMessage to allow its users to communicate freely with any other user in the ecosystem. What it does need is for the App Store to graduate from its current one-way status as a leaderboard for apps and become a conversation. Both between people that want to share great apps, and between the users of the app and those that make them. Apple now has the tools to make that happen, lets see what it does with them.